Giant-Size Geek: Can You Believe: Jerry Lewis And Wonder Woman, Together! Can You Believe: Jerry Lewis And Wonder Woman, Together! 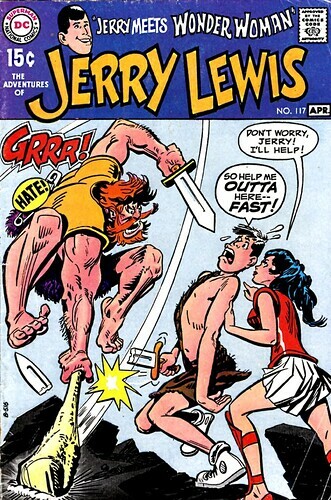 Can you believe, dear readers, that DC Comics published a Jerry Lewis series--and that it lasted 124 issues? Yes, indeedy, it did! And in Jerry Lewis #117 (1970), the comedian had a team-up with Wonder Woman! This was the all-new, all-now, mad-mod powerless Diana Prince teaming up with Jerry--which is why she wasn't wearing a star spangled bikini. I doubt Jerry could have handled that anyway. Hmm...now I am wondering if there was a French version of this comic...and was it popular at that time? Nuff said.